Aprilaire - 1850F : Dehumidifier Review • The Air Geeks, reviews of air conditioners, dehumidifiers and air purifiers. Aprilaire! An iconic brand that we are used to see trusting the top positions. 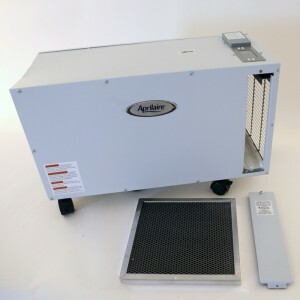 The Aprilaire 1850F is a high capacity humidity control system that is suitable for spaces that are as large as 5,000 square feet. This strong dehumidifier is capable of drawing up to 95 pints of moisture from the air per day. The 1850F removes excess moisture from the air to ensure that your room has a comfortable environment. To start with, the 1850F is a high capacity unit that is suitable for large spaces. It is suitable for large bedrooms, living rooms, offices, computer labs, basements, and so on. According to the manufacturer, this unit is suitable for rooms that are as large as 5000 square feet. Nevertheless, from our research, we have established that the unit performs well in smaller rooms. When the filter is open! The 1850F is designed to pull a lot of moisture from the air within a short time. This high capacity unit is capable of pulling up to 95 pints of moisture from the air per day. In case you live in a high humidity place, then this may be the right solution for your dehumidification needs. Considering that excess moisture can damage your possessions, this unit controls relative humidity to prevent rotting and corrosion. In addition, it brings the moisture level down to create an environment that is unsuitable for the growth of mold and mildew. In extremely cold environments, there are high chances of frost building up inside a dehumidifier. If that happens, the dehumidifier may fail to perform as expected thereby allowing air moisture to rise beyond your desired levels. This unit features an auto defrost mechanism that prevents frost from building up inside the unit. You therefore don’t need to worry that frost will render your humidity control system useless. Does the 1850F offer user-friendly controls? Yes, this dehumidifier offers a user friendly interface that enables users to control the relative humidity of their rooms with ease. Its automatic humidity sensing mechanism ensures that the amount of moisture in the air does not exceed the desired level. In addition, this dehumidifier has low maintenance requirements. Just like most dehumidifiers, the 1850F is not a whisper quiet appliance. Although the manufacturer indicates that this unit runs quietly, we have noted that it produces a loud sound that can be a source of disturbance if the unit is placed in a quiet place. Will you need to work or play when the unit is working? In case you are highly sensitive to noise and you intend to place this dehumidifier in your bedroom, then you may need to think about another brand. However, this unit does not produce an irritating sound – more like the “hmm” white noise of an air conditioner. Easy to unpack, install and operate. Considering that some appliances are difficult to install and operate, the design of this unit allows users to install it within a few minutes. In addition, this unit has low maintenance needs. Effective and original auto defrost function. The auto defrost function of this unit is highly effective and the user does not need to worry that frost will build up when the temperatures are low. Not suitable for large rooms. Although the manufacturer indicates that this unit is suitable for rooms that are as large as 5000 square feet, we have noted that it performs poorly when placed in such rooms. However, its performance is better when placed in smaller spaces. Produces a loud sound. As expected from a dehumidifier, this unit produces a loud sound that can be disturbing to people who are highly sensitive to noise. Nevertheless, it does not produce horrible sounds. I placed this in my heated garage to take care of the moisture on the windows and doors. A little noisy, but not a big deal. Also needs at least 55 degrees to operate properly. If it worked at 50, I would have given it 5 stars. Very solid construction! Highly recommended. I'm considering a second one for the house once summer arrives." I bought the earlier model 3 years ago. It stopped working. I consulted the manual and did all of the trouble shooting tips. none of that worked. I called customer service and they were TERRIFIC. They talked me through the process of fixing it, when that did not work, they emailed me a form which I filled out and they shipped me a whole new dehumidifier for no cost. It is the newer model which now has another 5 year warranty. Through all of this, I had to call customer services 3 times. Every time they answered the phone quickly and they totally came up with the information I needed and they took care of me. The new dehumidifier has been in my basement for 24 hours and it has drawn 10 gallons of water out of the air. My basement is dry once again." If you are interested in a high capacity unit that can draw a lot of water from the air, then the 1850F is a suitable option. This unit is suitable for medium and relatively large rooms and has low maintenance needs. Where do you intend to place this unit? In case you are planning to use this unit in your bedroom or office, the amount of noise it produces makes it an unsuitable option. 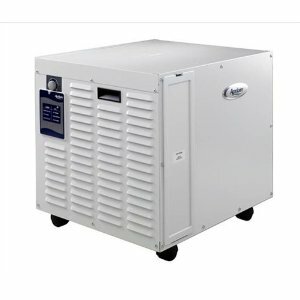 If you are planning to place this dehumidifier in your basement, then you can proceed and buy it for your dehumidification needs!